Ultralife's shrimp trap is a must-have item. Do you have fish that started going missing in your tank? Do you hear that suspicious clicking coming from your live rock? Chances are if you have live rock, you have hitch-hikers, like harmful mantis shrimp, pistol shrimp or crabs. This X-Terminator trap is the answer to this problem. It quickly helps you to remove any unwanted creature, even in the hardest situations. The X-Terminator trap uses a unique mechanism that is sensitive to the slightest movements to trap these tiny creatures without interfering with larger organisms. You can adjust the sensitivity mechanism to catch larger or smaller creatures, making the X-Terminator useful for all sorts of situations. Do not play around with the safety of your fish! Get your X-Terminator today. 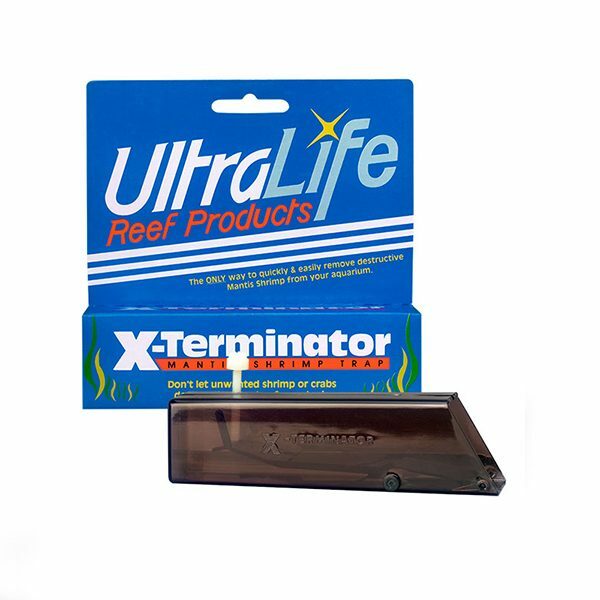 The X-Terminator trap is also Excellent at catching small fish in Nano Tanks. INSTRUCTIONS: Install threaded sensitivity adjuster into the hole on top rear of trap. Set trap by gently releasing door latch on top of the trap while pushing the door inward. The door will lock into place and remain open. The release sensitivity can be adjusted by turning adjuster clockwise (more sensitive) or counter-clockwise (less sensitive). Place bait (krill, freeze-dried foods, etc.) into the rear of trap. Make sure bait remains clear of the trip panel. Place baited trap into the aquarium, as close to the home of the unwanted creature as possible. The trap will now do the rest. To release shrimp from the trap, push the door open with pencil until it remains open. Turn trap upside down and allow shrimp to exit the trap.